When my father-in-law was told he had cancer that had spread to his liver and was inoperable, we were stunned. For my husband and I, this was the closest person to us that we'd ever known to have cancer. We didn't quite know what to say or how to help. Only with the Lord's help did we get through those difficult weeks, but a book such as this may have offered insight into the confusing and heartbreaking world of cancer. Mr. Murphey's appendix is meant to be the most practical part of the book. "He's witnessed too many situations where genuinely caring people had no idea what to do, so he has tried to give a few general guidelines," such as what to do before you offer help, what you can do now, and handling the possible long-term care of this horrible disease. When Shirley walked in from the garage, she didn't have to say a word: I read the diagnosis in her eyes. I grabbed her and held her tightly for several seconds. When I released her, she didn't cry. The unshed tears glistened, but that was all. I felt emotionally paralyzed and helpless, and I couldn't understand my reaction. After all, I was a professional. As a former pastor and volunteer hospital chaplain I had been around many cancer patients. I'd seen people at their lowest and most vulnerable. As a writing instructor, I helped one woman write her cancer-survival book. Shirley and I had been caregivers for Shirley's older sister for months before she died of colon cancer. All of that happened before cancer became personal to me--before my wife learned she needed a mastectomy. To make it worse, Shirley was in the high-risk category because most of her blood relatives had died of some form of cancer. Years earlier, she had jokingly said, "In our family we grow things." In the days after the diagnosis and before her surgery, I went to a local bookstore and to the public library. I found dozens of accounts, usually by women, about their battle and survival. I pushed aside the novels that ended in a person's death. A few books contained medical or technical information. I searched on-line and garnered useful information--but I found nothing that spoke to me on how to cope with the possible loss of the person I loved most in this world. Our story ends happily: Shirley has started her tenth year as a cancer survivor. Not only am I grateful, but I remember my pain and confusion during those days. That concerns me enough to reach out to others who also feel helpless as they watch a loved one face the serious diagnosis of cancer. That's why I wrote When Someone You Love Has Cancer. I want to encourage relatives and friends and also to offer practical suggestions as they stay at the side of those they love. The appendix offers specific things for them to do and not to do--and much of that information came about because of the way people reacted around us. It's a terrible situation for anyone to have cancer; it's a heavy burden for us who deeply love those with cancer. Leaving a comment on this post will enter you into a drawing for a gift basket ($300 retail value), which includes When Someone You Love Has Cancer as well as other books and cds, from Kathy Carlton Willis Communications (KCWC). Winner will be chosen by KCWC from all blogs participating in Mr. Murphey's blog tour. This sounds like a very helpful book! Hi there, you posted a couple above me on SITS this morning. Just popping by to say hello. Interesting book. It's amazing that, with cancer being so prevelant in our society, people are still at a loss as to what exactly is the right thing to do. I would like to think I would "just know" if I was faced with the situation, but I have a feeling I'd need a book like that. I'm not sure how the story with your father-in-law ends, but I hope the answer is "happily". All the best to you! Have a great day! A very dear friend of ours is battling cancer and it isn't going well. Her daughters are 16 and 19 and they are having a very hard time dealing with it. I would love to give these items to them to help them. Thanks for the chance to win it. When someone you love has cancer it changes your life as well as theirs’. As a former pastor’s wife so many times I longed for words of comfort, encouragement and even prayers for ill friends and family members. 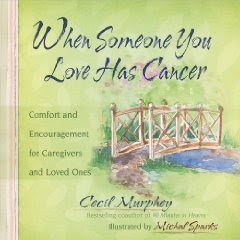 I know Cecil Murphey’s book will be a great help to the many of us who’ve lived with and love cancer patients.